I always find Dr. Sabala gets right to the root of the issue and is very knowledgeable. She is fully equippedto handle a variety of ailments and conditions. I always find Dr. Sabala gets right to the root of the issue and is very knowledgeable. She is fully equipped to handle a variety of ailments and conditions. 1st visit. I had a morning appt and there was zero wait. Did my paperwork and went back right away. Nursespoke with me and took info for the doctor. Doctor came to see me in less than 10 mins. She was polite and listened and asked questions I had not even thought to report. She gave me her thoughts on what the issue may be and took blood to do further testing. Gave me prescription and a follow up in 2 weeks. I can say I was pleased with the Doctor and will be back for my follow up. Thank you. 1st visit. I had a morning appt and there was zero wait. Did my paperwork and went back right away. Nurse spoke with me and took info for the doctor. Doctorcame to see me in less than 10 mins. She was polite and listened and asked questions I had not even thought to report. She gave me her thoughts on what the issue may be and took blood to do further testing. Gave me prescription and a follow up in 2 weeks. I can say I was pleased with the Doctor and will be back for my follow up. Thank you. 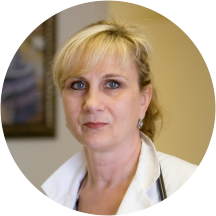 Dr. Bozena Sabala is an attentive and detail oriented family physician based in Clearwater, FL. Born in Cracow, Poland, Dr. Sabala earned her medical degree from the University of New England. She completed two residencies, one in family practice at North Shore-LIJ Health System and the other at Good Samaritan Medical Center. Dr. Sabala obtained extensive training in dermatology and also in adjustments for back and hip pain. Dr. Sabala is a member of the American Osteopathic Association. Patients see her for a variety of reasons including annual physicals, flu shots, vertigo, sinus problems, and birth control. Because Dr. Sabala is bilingual in English and Polish, patients from a variety of backgrounds enjoy having her as their physician. Dr. Sabala offers services like skin cancer removal, chemical peels, Botox, facial fillers, and sebaceous cyst removal. Her treatment plans are customized to each patient and target the root cause of problems in addition to the symptoms with which they present. Bozena B. Sabala, D.O., P.A. Listens Very Well To Your Comments.Mentioned My High Reading on my Home Blood Pressure Cuff. Her Nurse Stated, The Home Cuffs Are Mostly Incorrect''? Always comfortable to discuss anything. Always well taken care of. Very professional. She listened to me and talked with me about my concerns. Thank you. Looking forward to our new patient doctor relationship. In addition to my regular visit, Dr. Sabala adjusted my neck. I can't believe how much better it feels. I am so very happy with my doctor. I received more care, understanding and explanation than I expected....I am pleased with her professionalism! Dr Sabala is professional and very knowledgeable about medicine and healthcare practices. She takes time during your office visit to review results with you and answer your questions. She is very thorough. I like her bedside manner and highly recommend her. Jo B.
I am so happy with my doctor. There doesn't seem to be any problem I can throw at her that she can't fix. Today, I offhandedly mentioned that I was having neck pain and was thinking of going to a chiropractor.She said, "I can adjust that for you," then did exactly that, in a matter of minutes. So, in addition to having my check-up and flu shot and usual medication refills, my neck feels absolutely fantastic for the first time in weeks. She took a lot of time with me and was very patient and did all the procedures that need to be done I would highly recommend her. She was great! Very helpful; really listened to what my concerns where and helped me to come up with a plan of action. I would 100% recommend her! The staff is very friendly, and the wait to get into a room was really short. The service as alwasys perfect. The staff make you feel as you are between friends. She is always very professional and goes over everything with you. She was so very nice. Took the time to talk to me about everything I was concerned with and set a plan in motion to follow up. Highly recommend her and look forward to having her as my primary. Super nice and professional. Very clean office and friendly staff! While I'm sure she may be good for certain things, I would definitely not recommend her if you are struggling with mental health. The cold and judgmental treatment I received plus talking over me after asking a question made it verydifficult to want to seek additional help after but I'm glad I eventually did. Doing much better with a compassionate doctor who listens now. I Believe She Really Cares For My Good Health. She Ask Questions About How I Feel. short wait time. takes time with me. i am feeling so much better after my visits. She has helped me to feel good again great office staff and assistants, very happy! She is always a pleasure and a true professional. She is a great doctor she doesn't hold back even if it's not what I wanna hear she is straight forward I love that and the only doctor I want. Dr. Sabala is very professional and extremely helpful. Terrible. She was rude every time. Saw her for the first time at age 20. First visit -- she asked me "what was wrong" with my eyes in a rude way (Duane's Syndrome), told me I smelled like cigarette smoke (myfamily smokes. All she wanted was to jump me birth control pill to birth control pill. I didn't want the pill, but the implant or patch. So glad I left her and got a doctor who listened. Dr. Sabala is the best doctor I have ever had. She is caring and so thorough in her evaluations. You always leave knowing that you are in good hands. I don't feel very comfortable going in there. She has no people skills. Incredibly professional, knowledgeable physician who took the time to get to know me. I look forward to working with Dr. Sabala in the future. Horrible experience - she is rude, dismissive and awful bedside manner. Will not return. Dr. Sabala was very pleasant and did NOT rush through the appointment. Dr Sabala is the best Dr I have ever had and I am 73 years old. I was very pleased with my first visit, everyone is very courteous and professional. I was seen within minutes of my appointment and was given the attention and help I expected. I would recommend the doctor to friends and family, asI was recommended also by a friend who has been seeing her. Friendly staff, no wait time, very thorough 1st appointment. Dr. does not take care of patients with health issues at all. The doctor was very rude and cut me off when I told her I have low testosterone. She told me I need to go to a specialist. This doctoris not a good doctor if she is in the business of seeing a patient just to refer the patient to another doctor.My other family doctor took care of all my health needs, unlike this doctor. The doctor's handshake when she came in the room was very unwelcoming. I highly do not recommend this doctor. I left half way through the appointment. She is very rude and condescending the way she talks to you also. I am new to the area and searched for a personal physician for several days and the earliest appointment I could find were three to four weeks away. Dr. Sabala was recommended by a friend and I was able to getan appointment the next day. Truly the best caring and personable physician I've ever needed to consult. She is the best doctor i ever had and pull no punches to tell you what the problem is and I appreciate that. This review is based on my one and only visit to Dr. Sabala's office. I will not return. Dr. Sabala had horrible bedside manner - very short, abrupt sentences, and really doesn't respond to questions. Because I am not a trainedhealthcare professional, I wanted a doctor who would take the time to explain things to me. She would not take the time and would seem frustrated as I continued to ask more questions. Example: Dr. Sabala - "your blood pressure is high" Me: "Oh, what does that mean?" Dr. Sabala - "It's high." Dr Sabala always takes the time to explain everything to me about her diagnosis of my visit and treatment. I leave feeling that I am in the best of care. very attentive to My Needs. seemed to Care about my Medical Needs And Cure Some Of The Kidney Problems i Have And Stones. I was so impressed with Dr.Sabala, her office and staff that I will be switching to her medical practice as my primary Doctor.